Thank you to Ellen Jaffe Jones, author of Eat Vegan on $4 a Day, for sharing this recipe with the Yummy Plants community! Ellen is committed to creating healthy dishes that are super yummy and affordable. This recipe isn’t from her book; Ellen created it just for us! Learn more about being vegan on a budget from her blog: The Veg Coach or chat with her directly on her Facebook page. 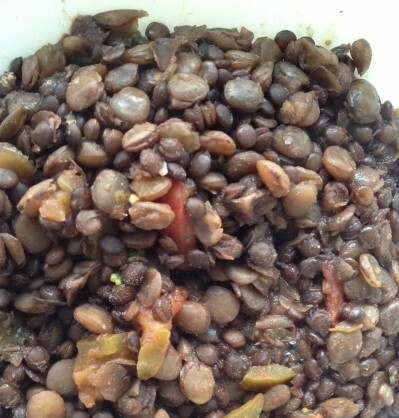 Note: Try cooking the lentils and beans the night before to make this a super quick meal. 1. In a large pot, sauté the onion and green pepper in 2 tablespoons water. As water evaporates, add more until onions are translucent. Add the beans and tomatoes, combining well. Note: If you are cooking the beans from scratch, follow the package instructions, or instructions from "Eat Vegan on $4 a Day." Then after draining the beans, add the onions, peppers, tomatoes and spices for the last 10 minutes of cooking. Let us know what you think of this easy vegan recipe: Bean Cheap-Out!